A Black Lives Matter flag flies over Norris University Center for the second year in a row. The flag signaled the start of Black History Month programming. A Black Lives Matter flag was raised Friday at Norris University Center to signal the start of Black History Month programming. The flag was raised in time for the Harambee event on Friday that “celebrated Blackness,” For Members Only vice coordinator Michelle Sanders told The Daily in an email. Sanders said Harambee kicked off Black History Month programming with the participation of many NU black-centric groups. The flag was raised for the first time last year, as students organized events and dialogue around the Black Lives Matter movement. It remained flying for two weeks. Norris executive director Jeremy Schenk told The Daily that Norris does not fly special flags often, and that this has been the only one flown both years due to student request and its connection to programming. Schenk said he received two or three emails from students representing different organizations requesting the Black Lives Matter flag to be flown this year. 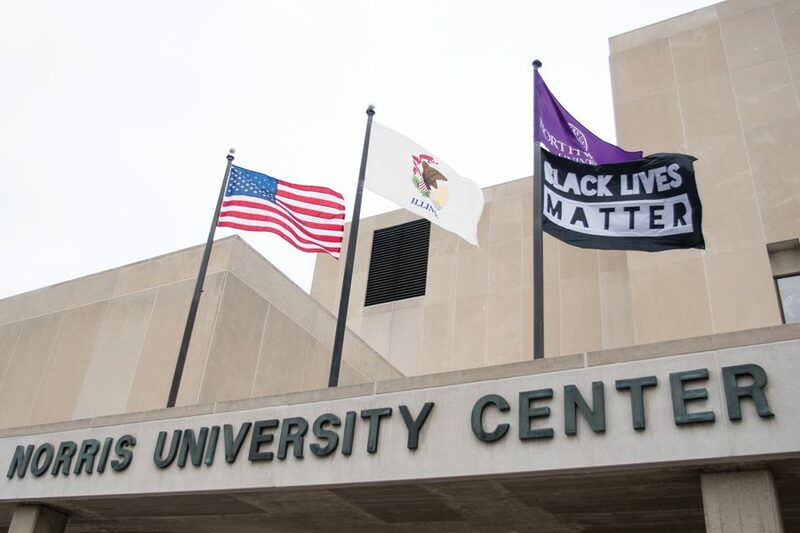 FMO president Kasey Brown said FMO wants to make the display of the flag an annual occasion for the University, as a way to show that NU cares about its black students. “We’re planning on putting pressure on the University, if they don’t continue on their own, to put the pressure on like we did this year to get that flag up every February,” Brown said. Brown said the flag will be flown the entire month of February this year, and FMO had been working with the University since November to ensure it would be raised. Programming for the month includes events focusing on black student protests, a screening of “Black Panther,” free HIV testing and The Collective, a program that aims to explore masculinity among men of color.